I stood in the maelstrom that was emigration from Malaysia at 2CIQ (Tuas Second Link) on the way back to Singapore and as I was jostled in the crowd for around 30 minutes, my mind started to drift off to contemplate the weekend in Kuala Lumpur — pondering not just DeBAKLe 2013 but also the general wargaming scene in Malaysia. 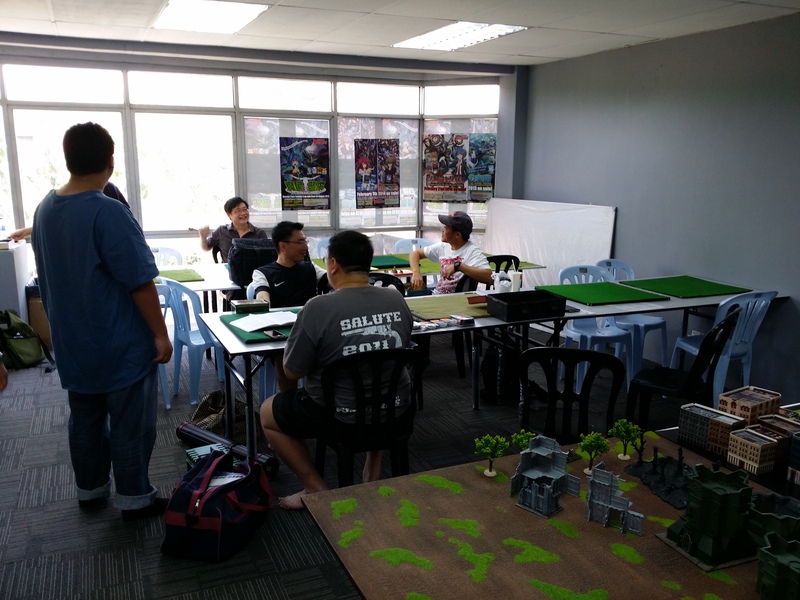 It does appear healthier than here in Singapore with quite an active group of wargamers meeting regularly to battle through different periods of history. There is currently a large Napoleonic campaign in under-way (Leipzig) with the battle being broken down into component parts and played over different weekends. At dinner with some of the guys on Saturday night (great choice of dishes by the way guys and a good reason for my weight having shot through the roof again – love eating in Malaysia) inevitably conversation was centred around wargaming, and armies and tactics, this was a refreshing change for me where wargaming conversation in Singapore is all too infrequent. For DeBAKLe 2013 there were a mix of experienced players and new, a good sign for the hobby there, as was the fact that there were 14 players at DeBAKLe 2013, the number up on previous years and causing David (who organises it) to consider four rounds next year. 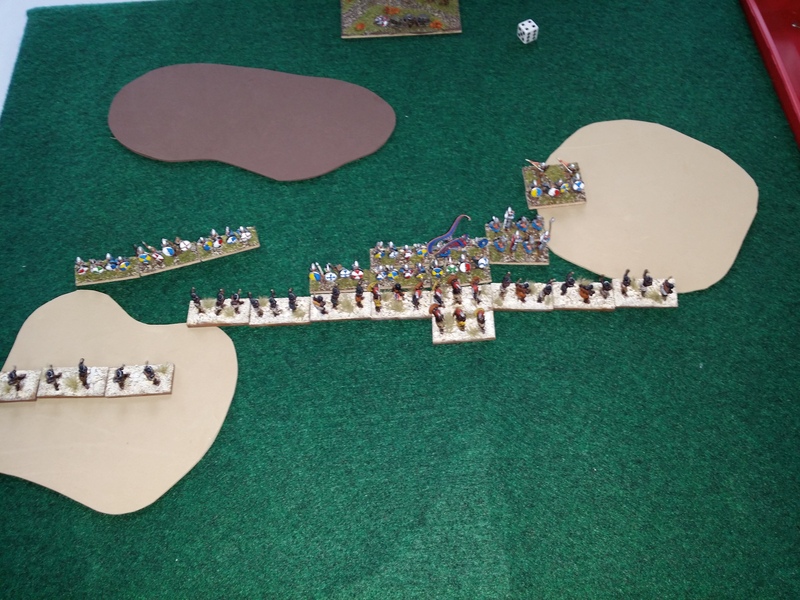 As readers of Thomo’s Hole will know, I had painted a Nubian Army to take to DeBAKLe 2013 over the five days before leaving for the competition. I am still pleased with that effort and some nice things were said about the appearance of the army there. This was my first battle – the Ch’in were fielded by AJ KJ and in what was a huge surprise to me, I was the attacker. It was a surprise as the Ch’in aggression was 3 and mine was 1. So, the Nubians invaded Ch’in China! AJ KJ laid out two woods and a road. 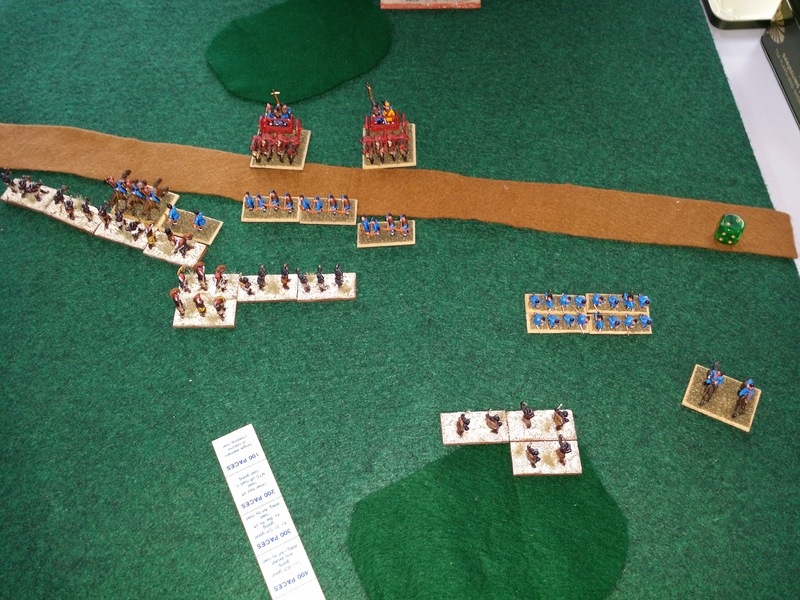 His army consisted of two heavy chariots (a sweet target for my bows), some cavalry and mostly warband and bows. The Nubians (Book I/3) consisted of two warbands, seven bows (one of which was the general) and three Psiloi. AJ KJ advanced over the table and tried to keep his heavy chariots away from my bows. He was successful in doing that however I managed after an early set back to remove his Cavalry, Psiloi and a Bow. I had lost two Bows by this stage. AJ KJ marched his warband into the wood to clear out the Psiloi there whilst I prepared to roll up AJ’s right flank. The best tactic possible then came into play. When AJ’s KJ’s warband hit my Psiloi, the battle factor was 2-1 in his favour and looking at little awkward for the Nubians. The die were cast and the result was a role of 6-1 in my favour. Scratch a warband. Game one then was a 4-2 victory to me – scoring me 8 points and AJ KJ 2. Faris was my next opponent and he was using Patrician Romans – a nice force because of the variations possible. He had a mix of knights, cavalry, auxilia, light horse, blades and psiloi. A good mix to take on the Nubians with a lot of good match-ups likely from his side of the table. 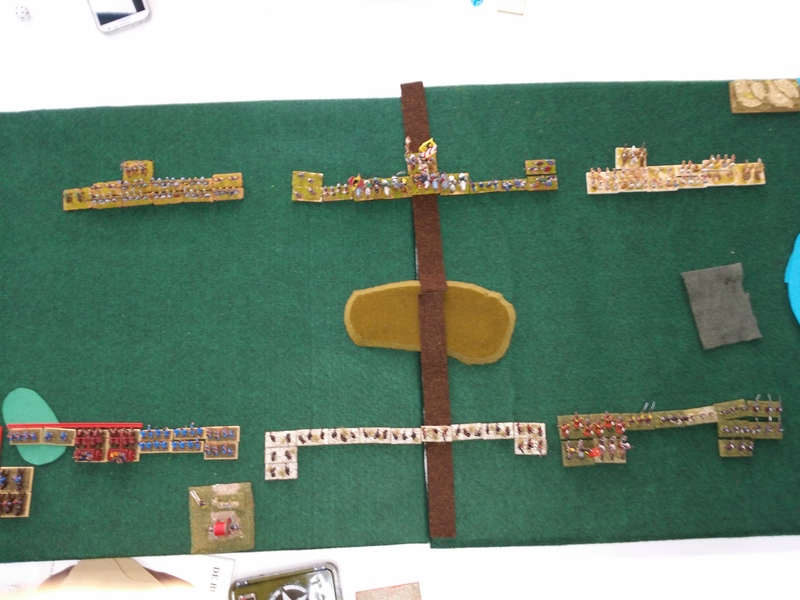 The Patrician’s are aggression 0 and I am aggression 1 but I lost the attacker/defender roll and laid out the terrain. Two sand dunes and an area of rough ground. 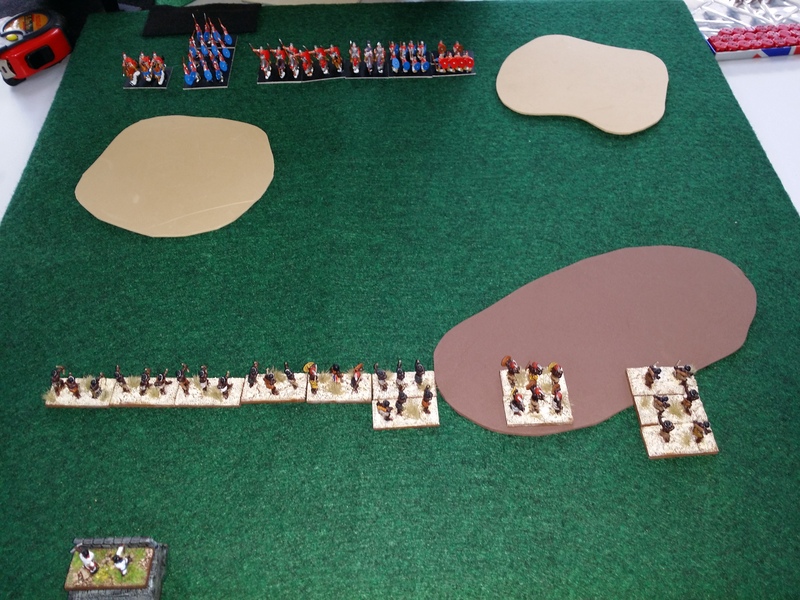 We deployed and my plan was to move things around so that my warband and psiloi faced off against his auxilia whilst my bows concentrated on his knights and cavalry and tried to stay away from his blades. Faris came forward and tried to get his bow killers into contact with the bows. However, I managed to keep out of the way of the Auxilia and manoeuvred the bows to get some shots on the cataphracts. Cataphracts died. It was a hard victory however as Faris managed to get some good troops into my bows and managed to kill my general. At that point I was three elements down (two bows and a psiloi, one of bows was the general however) and Faris was also three elements down. I rolled for PIPs and needed to roll at least 2 to do anything. A role of 4 saw me able to position myself well against his Psiloi and the result was a 4-3 victory my way, with another 8 points. Faris picked up 5 I think for this – 3 points for killing a general and two for the other two elements. I was in the top four at this point (surprisingly) and so it was on to the final round. I’ve been reading a lot of Bernard Cornwell’s Saxon series recently so when I saw the Anglo-Saxons, a mix of blades and spears (the shield wall) I thought of Uhtred! This battle was against Tony, also undefeated at this stage and his army was a mix of blades, spears and the odd Psiloi. They were aggression 1, same as me, but I ended up being the defender again. I placed my two areas of sand dune and one of rough going. We deployed and started to play. My only real hope in this battle was to get my warband into his infantry and hope for a quick kill. The shield wall rather than the blades was the target. 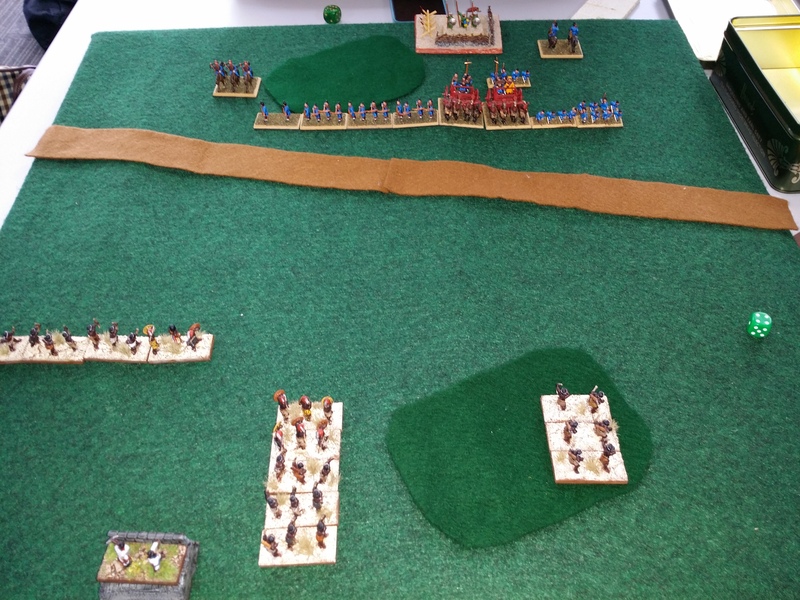 I used my light troops to anchor my left flank on sand dunes and arrayed myself between dunes, narrowing his attack frontage and I hoped keeping enough of his troops out of the battle until I could make some inroads into his forces. Tony left me an opening on the right of his centre and I was starting to work that. I really only needed to hold his centre and then start to wrap around it and even though it was the bows doing it, I figured I had a good chance to start to roll him up. The opening combat was therefore my bow general against his blades – a starting factor of 2-5 his way. I added one as I was a general and he subtracted one as he was overlapped so now 3-4. I rolled one on my dice roll so a roll of 4 or better on Tony’s and I was toast. He rolled 4 or better. The rest of my combats were closer but all my elements lost and were pushed back. Game over! I lost it 1-0 with the general being the casualty so 11 points for Tony and none for me. After the game totals were all tallied, I had come in a creditable (well, I thought it was creditable) sixth place using the Nubians, not a world beating army but with all those bows, one to strike, if not fear, at least a little uncertainty into the hearts of opponents. 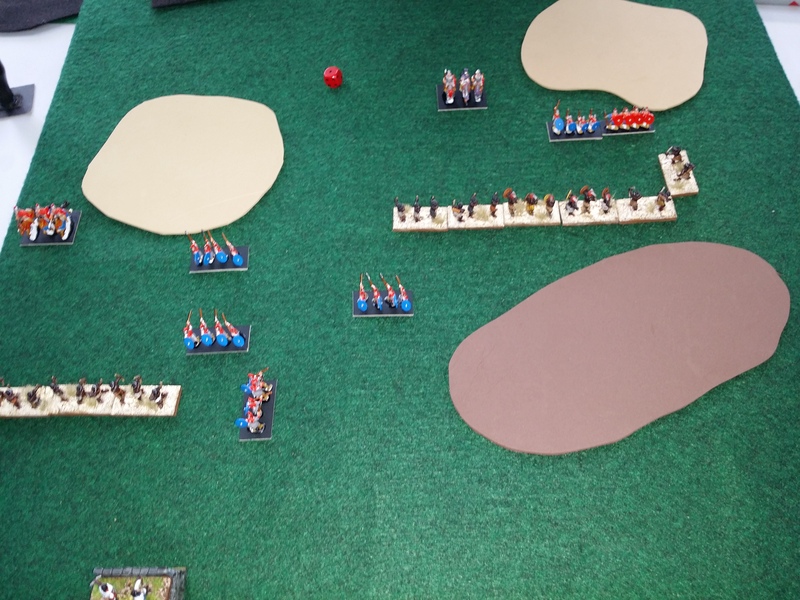 To finish the wargaming off for the day, we had a Big Battle DBA – which our side managed to lose conclusively with two commands broken and the third one element from breaking. After the wargaming was over, we adjourned to a Chinese Restaurant somewhere in Shah Alam or the Klang Valley for some typically great Malaysian Chinese food. Thanks to the Broken Bayonets for a wonderful weekend of gaming and special thanks to David Khoo and his family for putting me up and feeding me (more about the burger later). Next Article Post DeBAKLe 2013 — What to paint next? Thanks for the report Thomo, looks like fun. Good to read the reports of the Nubians in action, and good to see you going 2-1 for the day with them 🙂 One-day tournaments like that are always great fun, especially smaller size ones as I find they tend to often be more relaxed in general than some of the bigger events. 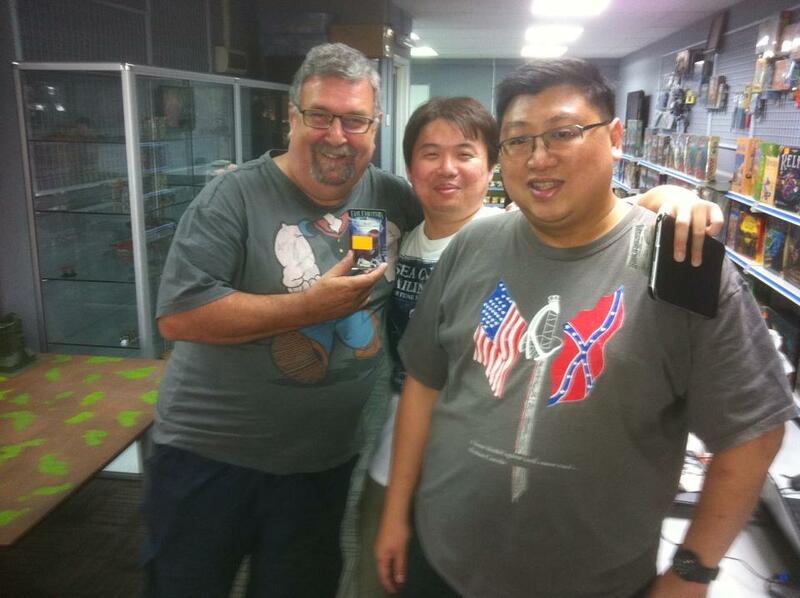 Turns out I will be going to Korea in late May this year, and will probably stop a day or two in Singapore on the way back home, so if you are around I might have to hit you up for a game of DBA, a refreshing ale or two and some wargaming discussions if you are in town at the time! Inspired by your epic completion of the Nubians in 5 days, I’ve begun a DBA army I hope to actually finish painting — Morean Byzantines, IV/51(b). A slightly unusual choice I guess, but I picked the Essex army pack cheap from Cancon this year, and the mix of figures is quite interesting and a touch exotic, so I will attempt to actually commit to finishing it. Whether it will happen, given my warmachine painting schedule, is another matter I suppose, but here’s hoping! I’ve found one solution to the getting the painting done and that is to make sure you paint one colour per day. Finishes the army surprisingly quickly.